Focus: Proximate mechanisms regulating intestinal performance for the Burmese python. Thesis: The functionality of the evolutionary loss of teeth in birds. One of the most effective approaches in understanding proximate and ultimate influences on morphology in is to compare populations exhibiting trait extremes (i.e., gigantic or dwarfed populations. To investigate influences on snake body size and head shape, I have focused on island–mainland comparisons because island populations often show extreme variation in body size and head shape compared to mainland populations. 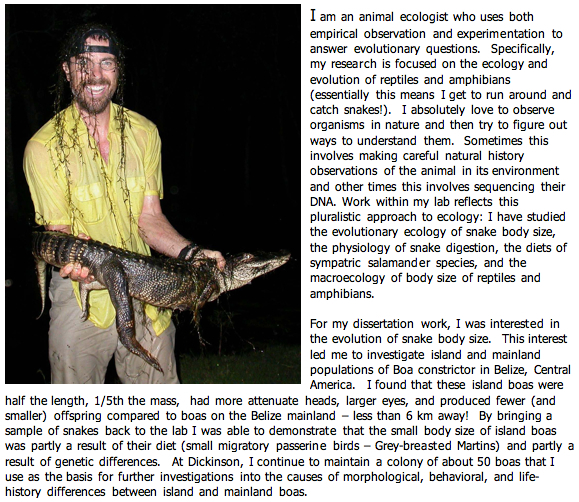 My dissertation research focused on evolution of a dwarfed race of Central American boas (Boa constrictor) inhabiting mangrove cays off the coast of Belize. Results from my field and laboratory work demonstrated that both small body size and attenuate heads of island boas are based in part on genetic differences from mainland boas and that these morphological features have evolved rapidly in response to insular prey availability. Currently, we are studying how the environment might influence the behavior of island and mainland boas. By rearing neonate snakes in an enriched (with trees) and non-enriched (without trees) setting, we can test whether the environment experienced by young snakes influences how they develop behaviorally. That is, do snakes need to experience an arboreal (enriched) environment to develop an arboreal habit? Or rather is this a fixed behavior such that any snake, regardless of their experience, is equally likely to develop an arboreal habit? We are testing this notion using neonates born from wild-caught snakes from island and mainland populations. Additionally, I continue to investigate the ecology and population biology of another population of dwarf boas that occur in the Cayos Cochinos archipelago, Honduras. 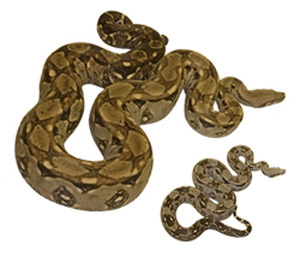 Similar to Belize island boas, Cayos boas have evolved small body size but, unlike those on Belize islands, Cayos boas are sexually dimorphic with females becoming much larger than males. These different patterns of dwarfism allow me to explore potential explanations for the evolution of small size. My work in the Cayos Cochinos is a long-term project with two major goals. First is to examine the ecology and evolution of these populations particularly focused on the proximate and ultimate causes for small body size. The second goal is to establish a long-term monitoring plan focused on estimating population parameters and to educate local Garifuna communities on the value of preserving these animals as a part of their natural heritage. This research involves field work in Honduras and typically occurs over the summer. Lastly, I have tissue samples from snakes from multiple island populations and the mainland. I would like to supervise a student interested in the phylogeography of these populations to better understand 1) how long have the island populations been isolated from the mainland?, and 2) how are the island populations related to each other? The field of macroecology has revolutionized how ecologists think of species interactions and biodiversity. Simply defined, macroecology is the study of how organisms interact with each other and their environment on large (e.g., continental) spatial scales. I am particularly interested in understanding the importance of body size in community structure, home range size, and energetics across large vertebrate clades. My past research has established that snakes do not conform to the patterns established by the endothermic model organisms (mammals and birds). However, snakes do however show a similar pattern to mammals and birds inhabiting islands. Small species of snakes appear to evolve a larger size when they colonize an island whereas large species of snakes appear to evolve a smaller size when they colonize an island. This general phenomenon has been called the “island rule” and has been established for mammals, birds, and now snakes. Future work in this area will utilize a large database of body sizes collected many vertebrate groups. We will address an array of questions including the spatial scaling of body size distributions, phylogenetic patterns of body size, and the existence of optimal sizes in monophyletic groups of organisms. This is one of the most exciting areas of my research program because I can address questions central to understanding patterns of vertebrate diversity that have not been possible with traditional ecological methods. 2008 Boback, S.M. and C. Guyer. A test of reproductive power in snakes. In press at Ecology. 2007 Boback, S.M., C.L. Cox, B.D. Ott, R. Carmody, W.R. Wrangham, and Secor, S.M. Testing the selective advantage of cooking in human evolution. Comparative Biochemistry and Physiology,Part A 148:651-656. 2007 Montgomery, C.E., Reed, R.N. Shaw, H.J., Boback, S.M., and Walker, J.M. Distribution, habitat utilized, size, and color pattern of Cnemidophorus lemniscatus on Cayo Menor, Honduras. Southwestern Naturalist 52(1):38-45. 2006 Mead, L.S. and S.M. Boback. Diet and microhabitat utilization of two sympatric Neotropical salamanders: Bolitoglossa pesrubra and B. cerroensis. Herpetological Natural History, 9(2):135-140. 2006 Boback, S.M. A morphometric comparison of island and mainland boas (Boa constrictor) in Belize. Copeia. 2006(2):261-267. 2005 Boback, S.M. Natural history and conservation of island boas (Boa constrictor) in Belize. Copeia. 2005(4):880-885. 2003 Boback, S.M. and C. Guyer. Empirical evidence for an optimal body size in snakes. Evolution. 57(2): 345-351. 2003 Boback, S.M. Body size evolution in snakes: evidence from island populations. Copeia. 2003(1): 81-94. 2002 Reed, R.N. and S.M. Boback. Does body size predict dates of species description among North American and Australian reptiles and amphibians? Global Ecology and Biogeography. 11(1): 41-48. Submitted CITES ($5,100), Education, awareness, and protection of Natural Resources, East End, Cayos Cochinos, Bay Islands Province, Honduras. the Cayos Cochinos, Honduras. Walt Disney World Company. 2002	Dean’s Research Award ($500), College of Science and Math, Auburn University. 2007 Society for Integrative and Comparative Biology (SICB), Phoenix, AZ – Testing the selective advantage of cooking in human evolution. S.M. Boback, Cox, C.L., Ott, B.D., Carmody, R., Wrangham, R.W., and Secor, S.M. 2007 Society for Integrative and Comparative Biology (SICB), Phoenix, AZ – Causal association between organ masses and aerobic metabolism in the diamondback water snake. S.M. Boback and Secor, S.M. 2007 Society for Integrative and Comparative Biology (SICB), Phoenix, AZ – Spatial and temporal variation in pH of the gastrointestinal tract of the Burmese python. S.M. Secor, Boback, S.M., and Lignot, J.H. 2006 American Society for Icthyologists and Herpetologists (ASIH), New Orleans, LA – Macroecology of body size in island herpetofaunal assemblages. S.M. Boback, Guyer, C. and Reed, R.N. 2006 11th International Congress of Parasitology (ICOPA), Glasglow, Scotland – Comparison of parasitic infections of Boa constrictor from mainland Belize and the surrounding islands. Lenaghan, S., Boback, S.M., Sunderman, C., Crim, A., Hester, L., Hill, B., and K. Tedin. 2006 Southeastern Ecology and Evolution Conference (SEEC), Tuscaloosa, AL – The reptiles and amphibian of Cayos Cochinos Pequeño, Honduras. Montgomery, C.E., H. Shaw, S.M. Boback, and R.N. Reed. 2006 Society for Integrative and Comparative Biology (SICB), Orlando, FL – A test of reproductive power in snakes. S.M. Boback and C. Guyer.